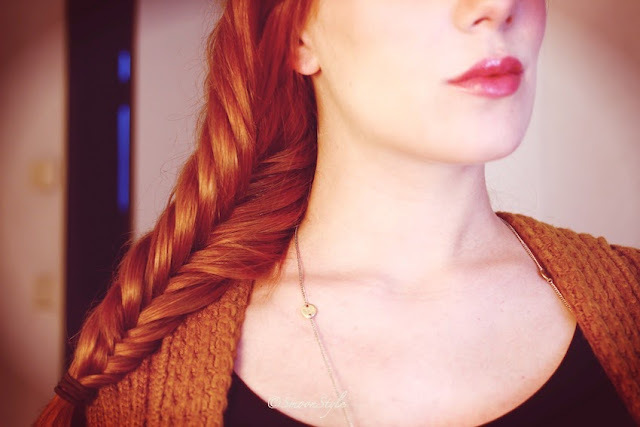 A current hair trend is the fishtail braid. I've actually never tried it, because it looked too complicated. Aside from curling my hair, I cannot do much. I can't even do the french braid. Well I tell you that it is much easier than it looks, however it does need some practice. I've only mastered the side fishtail braid so far. I find that it easier because I can see what I am doing. Here is a YouTube tutorial that is amazing and helped me create the fishtail braid that you see on the pictures. Has any of you mastered the technique? Lovely Simone. I used to twist my beard into something similar. Take it easy Simone. I've tryied with mine but its quiet difficult beacause my hair is kind of curly. Hope you're doing good, have a nice evening! I really like this kind of hairstyle, but it's always too difficult to me. I need to ask my friend to make it on my hair. Sorry, maybe it's hmm, confident question, but... have you done something with your lips? They look bigger. This is PERFECT on you!! Hope see you on a concert or video using this someday, because it looks soooo amazing on you!!! Hey it looks great on you! But beside this braid, the french braid isn´t so complicate. Just try it again ;) If you like, you find some nice "how to do" stuff for braids and other styles for long hair on http://kupferzopf.com/flechtfrisuren/tipps_flechtfrisuren.html . She has so great Styles there and it´s so easy explained! I have very long hair and it´s no problem doing the french braid or maybe a dutch braid. I've been practicing the Fishtail braid for some time now, as well as the French and Dutch braid. It is very dificult to me, but for my mom no, so she practice on my hair and it looks very nice :D.
I really love how it looks, I'll try to do it! Simone, could you do more posts like this one, with examples of hairstyle tutorials? I'm sure a lot of people will like it. I have tried to do some hairstyles and tricks from http://thebeautydepartment.com, but my hair always ends up in a mess :) the side fishtail looks easier though, I will try it! Ziet er super mooi uit. Ik kan echt helemaal niks met mijn haar. Ik ben zo'n kluns in haar dingen, haha. Misschien raar dat ik dit zeg, maar ik heb een artikel over jouw voormalige lipstick MAC Chatterbox geschreven; http://beautyshift.nl/?p=494 Misschien dat je het leuk vind. I love Fishtail braid but i cannot do it so my roomate has to do it for me :p Thanks for the tutorial, seems quite easy. Now i'll have to practice with her. http://instagram.com/p/rM31PbMdMC/?modal=true I did, but went very messy haha.